A week or two into an employee’s training program, each new hire is offered one month’s salary…to quit. The idea is that it helps to weed out people who don’t actually want to work at Zappos rather than waste a lot of time, resources, and energy into investing in them as an employee. I was reminded of this a few days ago when I watched this College Humor video. 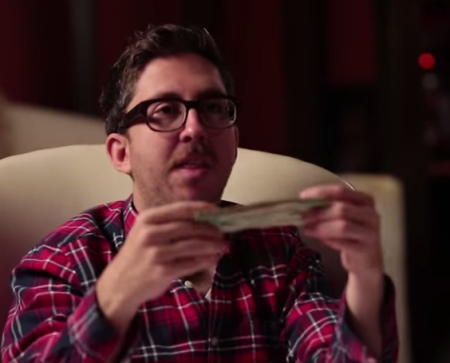 It features a College Humor regular, Amir, on a hapless date. As things are spiraling downwards, Amir pulls $500 out of his wallet and offers it to his date, saying it’s something he does for all of his dates. They can take the cash and leave, or reject it and stay, proving that they are interested in him. It’s the same thing as the Zappos offer (except more demeaning). I wish it weren’t so demeaning, because I think it would be interesting to do something like that on a date (but with a little less money–$500 is a lot!). What do you think? How would you react if someone made such an offer to you (say, $100) on a first date? This entry was posted on Sunday, November 16th, 2014 at 11:49 pm	and is filed under humor, relationships and tagged with humor, relationships. You can follow any responses to this entry through the RSS 2.0 feed. This is an interesting idea and with some of the terrible first dates I’ve had, it’s something I would have been tempted to try just to escape a boring or awkward connection– plus putting the money out there and having it accepted would eliminate that post-date anxiety of wondering if they might want to drag out the torture with a second date (the anxiety comes from then having to decline politely). I doubt many people would actually accept such an offer though, just because in a dating situation it would be too weird (at least for me) and more than a little offensive to have a date be so uninterested that they would be willing to pay money to get away from me. Katy: As for the last line you mentioned, it’s more like the other person is interested, but they want to make sure that you’re interested, hence the money. I agree with Katy that there would definitely be an awkwardness in accepting the money so you could end the date. Even though I haven’t dated (by choice) in almost a year, I was recently cajoled into being set up with someone despite my protests. We met for lunch and while it wasn’t horrible, it wasn’t the best date I’ve ever been on either. There were a few things about him that made me wonder if we’d be a good match, but the date also seemed to show some promise as well. So, I tried to think about what I would have done if he’d made me this offer in the middle of lunch. In scenario A, I take the $100 and leave. Sure, I’ve got a little extra cash now, however, there is always a little nagging thought in the back of my mind that it might have worked out between us and I’ll never really know for sure if I should have rejected the money and gotten to know him better. In scenario B, I decline the offer and stay. At the end of the meal, we leave the restaurant and I discover that he has illegally parked in a handicapped spot outside. I know that he is illegally parked there because he points it out to me and proceeds to laugh about it, as if this is something in which I’m supposed to find humor (yes, this actually happened). On the downside, I’ve already declined the money and have nothing to show for this date, but on the plus side, I am now 100% sure that he is a jerk and I will never wonder what could have been (I’m also reminded about why I stopped dating). I can honestly think of one disaster date where I would have gladly taken the $100 and left, but I think I would normally like having the peace of mind that comes with sticking out a mediocre date just to make sure I wasn’t mistaken in my initial impression of the person. If they were offering $500 though, I’d probably be more likely to go with my gut instinct and end things on the spot. Even I’ve got my price, and I could have a lot more fun with that money than I’d probably have with them! Katie: It’s interesting that $100 probably wouldn’t be a good idea in your mind, but $500 would be! 🙂 That is a lot of money. What kind of a person would laugh about intentionally parking in a handicapped parking spot?! The kind of person that won’t get a second date. I’d leave immediately without the money! There’s something really offensive about that offer. Didn’t you have a cookie date like this? Take the cookies and not see her again or have a second date with her. A cookie date? I don’t recall that, but it’s quite possible. You’re not crazy, Jasmin! I totally remember the cookie date story. We all went crazy with our opinions on whether they should have a (2nd?) date. I think she even did a guest blog about it, didn’t she? Can’t believe this was 4 years ago! What can I say? I like cookies. Okay, I definitely remember that dating experience now…I just don’t associate it with cookies.